Methods: In this study, virtual screening strategy combined with Bayesian categorization modeling, molecular docking and binding site analysis with protein ligand interaction fingerprint (PLIF) was adopted to validate some potent ACC inhibitors. First, the best Bayesian model with an excellent value of Area Under Curve (AUC) value (training set AUC: 0.972, test set AUC: 0.955) was used to screen compounds of validation library. Then the compounds screened by best Bayesian model were further screened by molecule docking again. Results: Finally, the hit compounds evaluated with four percentages (1%, 2%, 5%, 10%) were verified to reveal enrichment rates for the compounds. 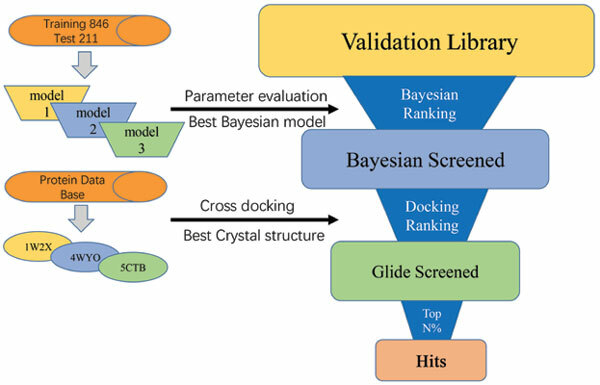 The combination of the ligandbased Bayesian model and structure-based virtual screening resulted in the identification of top four compounds which exhibited excellent IC 50 values against ACC in top 1% of the validation library. Conclusion: In summary, the whole strategy is of high efficiency, and would be helpful for the discovery of ACC inhibitors and some other target inhibitors. ACC inhibitors, bayesian classification model, machine learning, PLIF, virtual screening strategy, enrichment analysis.